The preferred beauty tip and secret of a host of top celebrity make up artists. An Exceptionally high quality, high performance scrub. Used to mechanically remove dead cells on the surface of the face. Comprising premium quality ground white marble powder, the perfectly spherical particles ensure the complexion is gently polished and refined without abrasion or irritation. Can be added to the skin with either of the Cleansers in the range, to exfoliate while cleansing. Use several times a week after cleansing the skin, apply a fine layer of Mild Scrub to the face and neck. Massage gently for a few seconds. If the cream becomes slightly dry as you are rubbing it, you may wish to add a little water in place of more cream and continue the massage for a short while. This will work very well as Mild Scrub contains enough scrub formula in one application to provide optimum results. Rinse off afterwards. 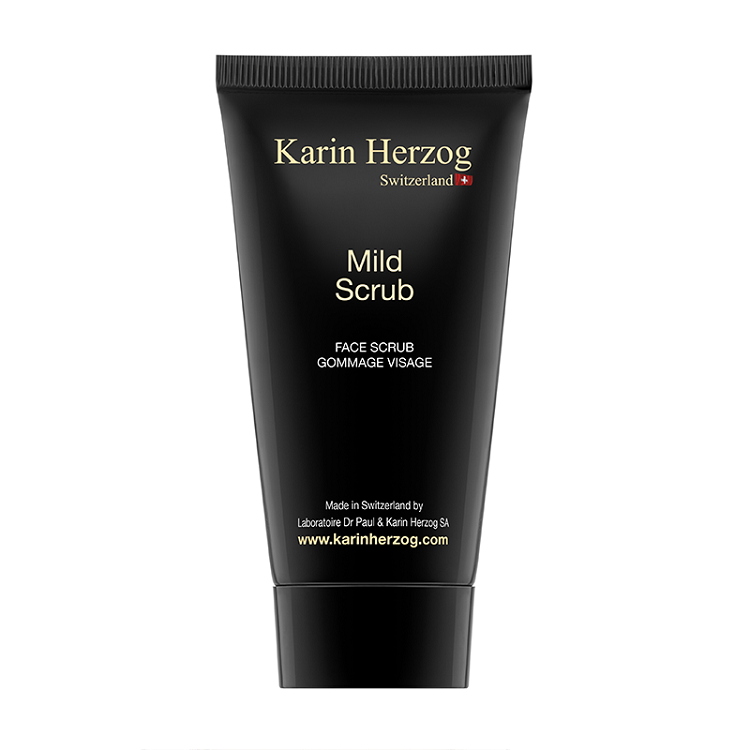 Alternatively, try combining the Mild Scrub with either of the Karin Herzog cleansers, for a nourishing exfoliation treatment. This scrub is gentle enough to be used once per day if you so wish. Clients who suffer from blocked pores or acne are encouraged to use this product every morning as part of their acne program. The scrub comes in a plastic tube and at times its hard to squeeze out as it seems it has lot of air in it and less product. product itself is finely granulated white particles and goes on skin very smoothly. you need just a pea size product and I couple this with essential mask followed by Vita Kombi Acream. This product gives instant glow to your face with blemishes lightened right after first use. I recently started using KH Facial Scrub. I immediately felt and saw the difference in regards to gentleness (no negative impact whatsoever on my skin), the finest satin feel of my skin afterwards, and more.